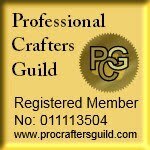 I have been sewing/crafting for over a year and have collected a number of useful bits and bobs over and above the usual kit. So I thought I would share with you those I use regularly. These have no end of uses but in particular I use the long thin one as a rubbish bin. It’s a great size to sit on a work table and can be moved about as needed. I find it particularly handy when unpicking as it can sit on your lap directly under your sewing so capturing those loose threads. They are also useful to gather together trimmings, buttons etc. for a particular project. You have all you need in one place for the duration of your project and you can also easily see if you are short of anything. I think these are for working with beads but I have found them invaluable when sewing. When unpicking they are great for picking out any loose threads that are left in the fabric. They are also useful when turning a narrow or pointed piece of sewing the right way out. You can use them as tweezers to pull the fabric or hold the points together to get into tight corners. They also act as a great “finger” if you are trying to sew something narrow on your machine, they hold down the narrowest of fabric. These are usually sold as nail scissors but I have found then great for snipping threads that the quick-unpick can’t get at. Also if you need to cut a thread close to the surface of fabric you can get a lot closer without the risk of cutting your material. When working small stitches or dark fabric and thread I have found using a cheap pair of non prescription reading glasses at a higher magnification than you would use makes such a difference. They are far easier to use than a table top magnifier or one of those ones you hang round your neck, they also look a lot better. Essential for when you are turning things to their right side or stuffing small items. My father made the wooden ones using the handles of some old wooden spoons. One has a rounded point like a pencil the other has one side of the point flattened. Its particularly good for running along the top of stuffing to even it out. I also have a "00" metal crochet hook which is great for tight corners. When working with dark fabric or on those too frequent dull days you need extra light. Rather than having to sew hunched over a table using a lamp you can sit where ever you want and direct the light exactly where you need it. Albeit 99% of what I make is sewn there is the odd thing, such as attaching brooch backs, where I need to use glue. Having struggled with tube glue and sticky drips sticking where they shouldn’t the glue gun has opened up a new world; at last I get the exact amount I need in the right place! I use loads of these. They are great for small projects, to keep together bits and pieces while you are in the middle of a make. They are also ideal for storing your trimmings, I keep mine grouped by colour. Last but not least is my small gingham tray! It’s essential if you work with a lot of buttons and beads as you can safely tip them out and sort out what you want to use as well as layout out other sorts of trimmings during the design stage.